Recent Arrival! 10 Speakers, 19" x 8.5" 10-Spoke Alloy Wheels, 4 Zone Air Conditioning w/Rear Air Controls, 4-Wheel Disc Brakes, 7" Color Driver Information System, ABS brakes, Adaptive Headlights w/Cornering Lights, Advanced Key, Air Conditioning, AM/FM radio: SIRIUS, Ambient Lighting Plus - LED, Anti-whiplash front head restraints, Audi Connect, Audi Side Assist, Auto-dimming Rear-View mirror, Automatic temperature control, Bose Sound System w/Subwoofer, Brake assist, Bumpers: body-color, CD player, Compass, Delay-off headlights, Driver door bin, Driver vanity mirror, Dual front impact airbags, Dual front side impact airbags, Electronic Stability Control, Exterior Mirror w/Memory, Four wheel independent suspension, Front & Rear Acoustic Parking Sensors, Front anti-roll bar, Front Bucket Seats, Front Center Armrest w/Storage, Front dual zone A/C, Front fog lights, Front reading lights, Front Seat Ventilation, Garage door transmitter: HomeLink, Genuine wood console insert, Genuine wood dashboard insert, Genuine wood door panel insert, HD Radio, Heated door mirrors, Heated front seats, Heated Power Front Bucket Seats, High intensity discharge headlights: Xenon plus, Illuminated entry, Knee airbag, Leather Shift Knob, Leather steering wheel, Low tire pressure warning, Memory seat, MMI Touch & Jukebox, Occupant sensing airbag, Outside temperature display, Overhead airbag, Panic alarm, Partial Leather Seating Surfaces, Passenger door bin, Passenger vanity mirror, Power Adjustable Steering Column w/Memory, Power door mirrors, Power driver seat, Power Liftgate, Power moonroof, Power passenger seat, Power steering, Power windows, Prestige Package, Radio data system, Radio: MMI Navigation Plus, Radio: MMI Radio Plus w/Single CD & 6.5" Screen, Rain sensing wipers, Real Time Traffic, Rear air conditioning, Rear anti-roll bar, Rear fog lights, Rear reading lights, Rear seat center armrest, Rear window defroster, Remote keyless entry, Security system, S-Line Exterior, Speed control, Speed-sensing steering, Speed-Sensitive Wipers, Split folding rear seat, Spoiler, Steering wheel mounted audio controls, Tachometer, Telescoping steering wheel, Tilt steering wheel, Traction control, Trip computer, Turn signal indicator mirrors, Variably intermittent wipers. Phantom Black Pearl Effect - Come check out Hi Tech Luxury Imports, Austin's best source for Exotic Performance vehicles. Save time and call our VIP Ecommerce team at 512-401-2663. Awards: * 2012 KBB.com Total Cost of Ownership Awards While every reasonable effort is made to ensure the accuracy of this information, we are not responsible for any errors or omissions contained on these pages due to errors with our third party inventory polling service. 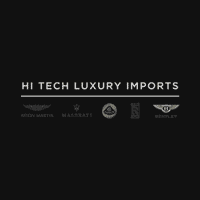 Please verify any information in question with Hi Tech Luxury Imports.